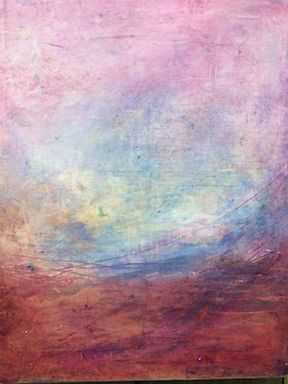 Lynne Wintermute works with cold wax, oil, acrylic and mixed media to create her ethereal paintings. Sharon Cook and Kay Pendleton will be joining her in her new studio in Neskowin for this event. They will all be doing demos throughout the weekend and will also be providing food and drink! From a young age Lynne’s keen sense for art and design was being cultivated. Her mother introduced her to Portland’s art galleries, craftsmen and artists, as well as her fellow architects. Potting, painting, and drawing with her mother were an integral part of Lynne’s childhood. In 1972, Lynne received her Bachelor of Fine Arts from Linfield College. She continued her education at the Museum Art School (now Pacific Northwest College of Art) as well as studies in Ireland and England. After college she worked professionally as a fabric and textile artist. Lynne’s love of textiles led her to Pendleton Woolen Mills where she spent 12 years in sales and marketing, becoming the third generation of her family to work for the iconic Oregon manufacturer. In 1992, while raising 4 children, Lynne opened her first retail store in Lake Oswego, Oregon, Lakeside Gifts, an upscale home décor boutique. There, she was quickly recognized for her elegant and unique design style, and earned a reputation for creative accessorizing , space planning, and design. Her passion for art was never far away, and in 2001 she was instrumental in the founding of Lake Oswego’s Gallery Without Walls, a continuing sculpture gallery throughout the city of Lake Oswego. She continued her involvement with the Arts Council of Lake Oswego for over 20 years. Lynne started painting full time in 2010 and continues to grow in her style and technique. She has studied pastel painting with Marla Bagetta and Teresa Saia and acrylic paintings with Lori Latham, Lana Grow, Marlana Stoddard-Hays, and Ruth Armitage among others. Lynne lives and works on the beautiful Oregon coast with her husband Barry Dragoon, and their boxer “Max”. Lynne lives and works in Pacific City on the beautiful Oregon coast with her husband Barry Dragoon, and their boxer “Max”.